Spin The Wheel for Up To 500 free spins! Visit website for full T&C's. You can expect a dazzling array of colourful streamers and balloons to welcome you to the party whenever you make your way over to Cheers Bingo. There is a lot to catch the eye, with the Spin the Wheel game being the most obvious, closely followed by the champagne bottle. However, it is important to dig beneath the pretty pictures and get the full story. 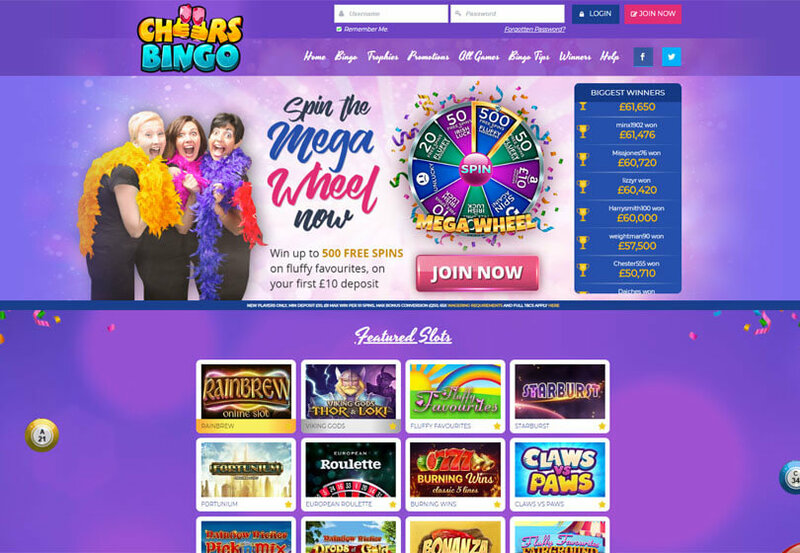 CheersBingo.com is situated on an affiliate network named 15 Network. All of the bingo sites on that network are powered by bingo software from a company known as Jumpman Gaming Limited. Jumpman and 15 Network are only recent players to enter the market, but already they are proving popular with online bingo operators. They like that 15 Network is less bloated than the likes of Dragonfish. Every site on the 15 Network serves a branding purpose, whereas the same can’t be said for Dragonfish. 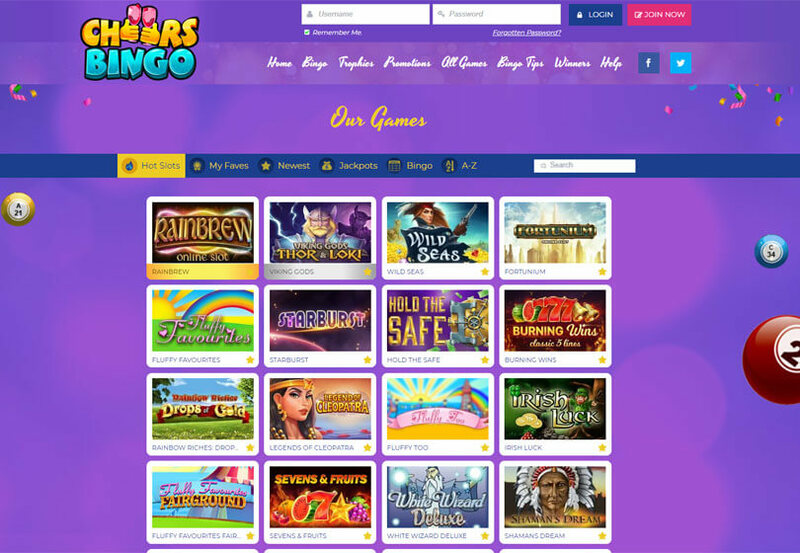 Cheers Bingo offers 90-ball and 75-ball bingo, as well as Video Bingo which allows you to enjoy a mix of bingo and slots and is only available on Jumpman Gaming sites. You can also try your hand of a great selection of instant games, casino games, scratch cards and slots – including best-sellers such as Fluffy Favourites. You can now play Cheers Bingo on mobile! There isn’t a downloadable app but to access the site – all you need to do is head to your mobile browser just like you would if you were on desktop. If you are already a member – your details will automatically be saved when you log in, and if you are a new player it will take just a minute or 2 to set your account up. There is a really awesome deal that kicks in when you deposit £10 straight after you join. CheersBingo will give you the chance to Spin the Wheel for serious prizes. This will allow you to win a range of prizes, from free spins to vouchers. This is a great bonus to get your hands on for just a tenner deposit, we love the fact you can win shopping vouchers. Cross your fingers and hope for one of the larger prizes! Cheers Bingo is also well celebrated because of its bingo promotions. The site always seems to have new prize game on the way or some fresh promo for the month, with 15 Network calling the shots on promos. Although the majority of promotion are shared network promotions – 15 Network do a good job in ensuring there are some great ones from you to choose from. This includes the chance to win a £50 free takeaway every single week in the Friday Night Takeaway game. Other cool regular promos include Lucky Lotto, Team Bingo and Monday Madness, Also kicking around are usual suspects such as the VIP scheme, chat games and friend referrals. What Could Cheers Bingo Do Better? 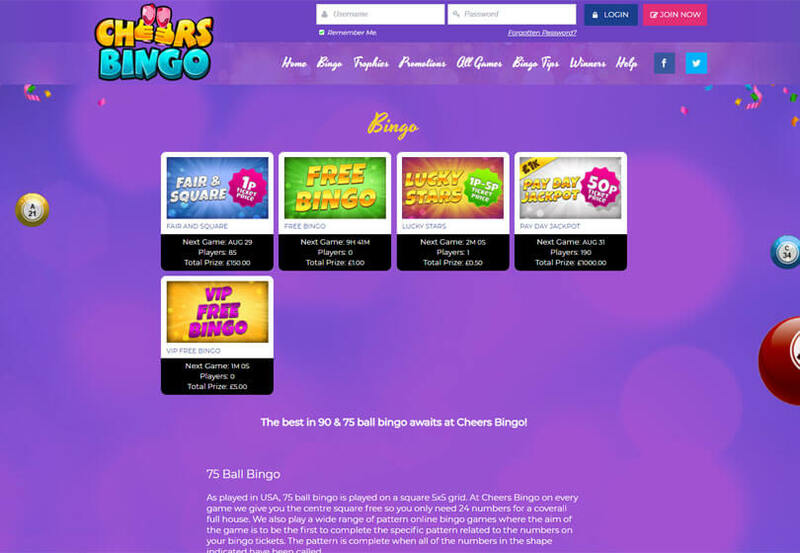 All round, this is a fantastic bingo site which we are sure you can tell from our Cheers Bingo review, but there are a couple of improvements that could be made. For example, although the networked promotions are good – they could do their bit and introduce some stand-alone offers that will allow something completely different for players to experience. There is also a lack of payment methods to choose from. You can use Visa, Maestro, MasterCard, Switch and Solo – but there aren’t any alternatives such as PayPal or Neteller to make use of. Although there are 1 or 2 things that can be improved – there’s still lots to enjoy at this brand.